David is best known for being a giant-slayer. It was quite a miracle that was a starting point that changed the future of Israel forever. “Reaching into his shepherd’s bag and taking out a stone, he hurled it with his sling and hit the Philistine in the forehead. The stone sank in, and Goliath stumbled and fell face down on the ground. So David triumphed over the Philistine with only a sling and a stone, for he had no sword” (1 Sam. 17:49-50). We are going to extract some principles out of David’s life so we can find out a little bit more about the miraculous. God is delighted to be a part of the miraculous if we will understand a little more about it. What God did in the Bible, He is still doing, because He is the same yesterday, today and forever. 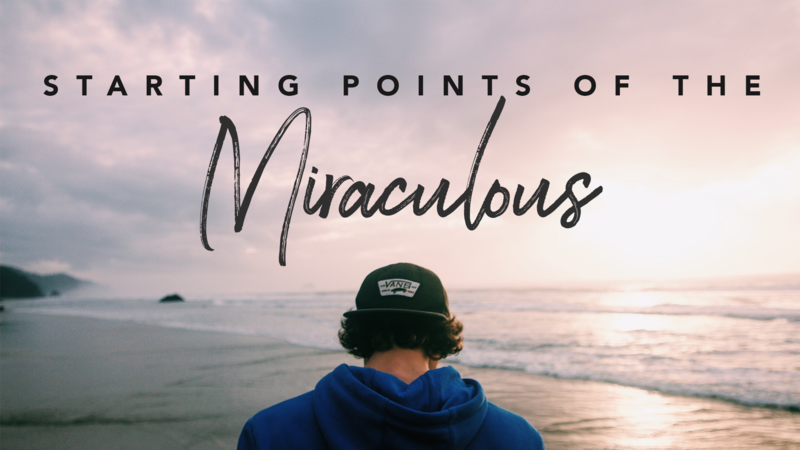 So we want to extract some principles out of David’s life about the miraculous to see if God is performing His miracles today. I wonder how much David practiced on the backside of the desert with the slingshot, day after day, writing songs and working with the sheep. The Bible says a lion and a bear attacked the sheep one day and David conquered and overcame them both. God was building all of these things in David so that when it was time for the miraculous, he was prepared. “The horse is prepared for the day of battle; but victory belongs to the Lord” (Prov. 21:31). There are certain factors that are beyond our control, but for the most part, many of us can prepare for a miracle and God would delight in us doing so. Here are some principles from David’s life to help us prepare for the miraculous. He did not put just one stone in his pouch; he put five. “He … chose for himself five smooth stones from the brook, and put them in the shepherd’s bag which he had, even in his pouch, and his sling was in his hand: and he approached the Philistine” (1 Sam. 17:40). Why did he have five? He only used one. Later on, in 2 Samuel, we discover that Goliath had four sons. It is almost as if David put in five stones, thinking, “I know that big guy is coming, but if his four sons come, I am going to need one for each.” David did whatever it took to overcome. It was during the daily-ness that David’s life and the life of Israel were about to change forever. “Jesse said to David, ‘Take this basket of roasted grain and these ten loaves of bread, and carry them quickly to your brothers. And gives these ten cuts of cheese to their captain. See how your brothers are getting along …’” (1 Sam. 17:17-18). David was a cheese deliverer that day. But David was willing to do what was unspectacular, maybe even monotonous. And in the midst of that, God changed Israel forever. Do not despise the daily-ness because God may have a miracle just around the corner if we will not bail out. See things the way God sees them because, if we don’t, we could end up fighting against God. God is saying that when we are confronted by situations, we must train our eyes to see things the way God sees them. We must train our eyes to see things into a higher state than they are rather than a lower state. God sees it in a higher state. David did not see a giant as an impossibility. He saw God as a possibility and changed the way he saw things. Every single one of us have had times in the past where God has done something wonderful or miraculous. But do you know what Israel’s greatest downfall was? They would forget. Remembering yesterday’s miracles will give us today’s courage. “‘Your servant has killed both the lion and the bear; and this uncircumcised Philistine will be like one of them, since he has taunted the armies of the living God’” (1 Sam. 17:36). All those things God has done, do not forget them because if we will recall them, God will remind us that the obstacles may be different, but the God who delivered us then is the same God who will deliver us again today.